Age-related macular degeneration (AMD) has emerged as a global public health issue with the highest number of cases currently in Asia followed by Europe.1 Polypoidal choroidal vasculopathy (PCV), formerly thought to be an exotic entity fit for case conferences, is now widely considered to be an AMD variant, with an increased prevalence among patients of non-European ancestry, especially those from East and South Asia. Population studies have found that 24.5%, 24.6% and 54.7% of individuals with neovascular AMD in China, Korea and Japan, respectively, have PCV.2-6 It is important to note that PCV has been described in patients of various ancestries and in both men and women. The first reported case of this entity was in an American woman of European ancestry. Yannuzzi presented this case at the Macula Society’s Fluorescein Angiography Club Meeting held just prior to the 1982 Annual Meeting of the American Academy of Ophthalmology, and the first published literature included 11 patients aged 40 to 71 years, one of whom was male and six of whom were African-American.7 Younger patients who have non-European ancestry, minimal to absent drusen, and neovascularization under the retinal pigment epithelium (RPE) should raise suspicion of PCV. Less commonly, PCV may occur in elderly patients of European descent. With the increased use of indocyanine green angiography (ICGA), PCV has largely been characterized by the presence of “polyps.” However, due to recent advances in imaging, as well as histological studies, some have proposed renaming the entity to aneurysmal type 1 neovascularization. What Is Aneurysmal Type 1 Neovascularization (PCV)? Along with the importance of the distinguishing clinical characteristics, multi-modal imaging, especially ICGA, is essential for accurate diagnosis. 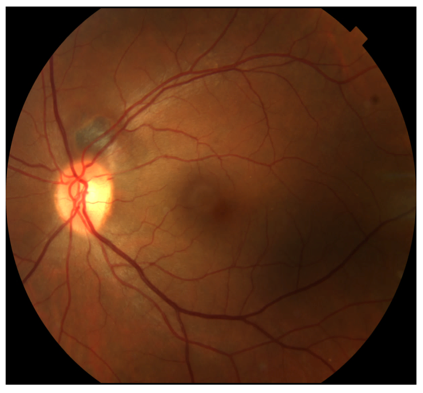 Fundus examination may reveal sub-RPE hemorrhage, which may be in the macula or the peripapillary region, and often there are minimal drusen (although drusen may be present) (Figure 1). Spectral domain OCT (SD-OCT) has become the predominant imaging modality in retinal disease and, in patients with PCV, will often demonstrate pigment epithelial detachments (PEDs) and sub-RPE pathology as PCV is a form of type 1 neovascularization. 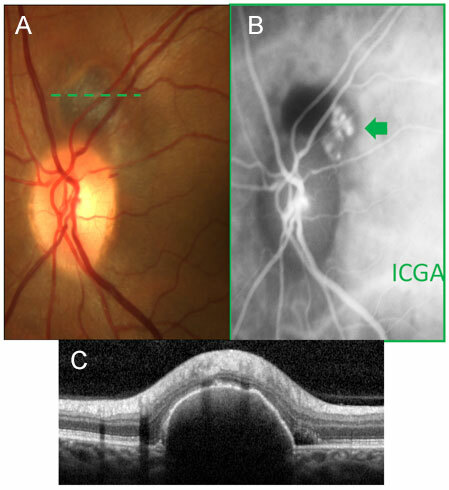 However, ICGA is still the gold standard and is essential for diagnosis (Figure 2). Further, fundus examination can demonstrate orange-appearing lesions. Additionally, on OCT, PEDs may have a characteristic “peaked” appearance (Figure 3). OCTA will likely play a growing role as an adjunctive imaging tool as the technology continues to improve, but again, ICGA is currently the gold standard to identify the characteristic aneurysms. Figure 1. Note the peripapillary lesion and lack of drusen. Figure 2A is fundus photograph of the lesion. Figure 2B is a spectral domain OCT image demonstrating a PED. Figure 2C is an ICGA image showing the aneurysms adjacent to the hemorrhage. Figure 3A demonstrates the orange appearance on fundus examination which can be present in aneurysmal type 1 neovascularization. Figure 3B demonstrates common OCT findings of a characteristic “peaked PED” as well as the “double-layer sign” of neovascularization between the RPE and Bruch’s membrane. Laser and pharmacologic treatments are the current standard of treatment in the forms of photodynamic therapy (PDT) and anti-vascular endothelial growth factor (anti-VEGF) therapy. Recent evidence from the EVEREST II trial demonstrated that PDT in combination with ranibizumab was superior to ranibizumab alone with regards to best-corrected visual acuity and polyp (aneurysm) regression (the study was designed for non-inferiority).12 Patients initially received standard PDT (light dose, 50 J/cm2; dose rate, 600 mW/cm2; wavelength, 689 nm) with verteporforin (6mg/m2) or a sham PDT followed by three monthly ranibizumab injections of 0.5mg and then on a pro re nata (PRN) basis. PDT or sham PDT was also performed PRN from month 3 onwards. At 12 months, the combination and monotherapy groups improved 8.3 letters vs. 5.1 letters, respectively (p = 0.01), with 24.5% vs. 14.0%, respectively (p = 0.03), having a three-line or better improvement in visual acuity, and 69.3% vs. 34.7%, respectively (p < 0.001), demonstrating polyp (aneurysm) regression on ICGA.12 Finally, the study demonstrated that those treated with combination therapy required fewer intravitreal ranibizumab injections (four vs. seven). Another option that has shown good efficacy in our experience (but has not yet been validated in a clinical trial) is what we term “planned PDT,” in which the patient receives aflibercept every month for three months and then an ICGA is performed two weeks after the final loading dose when anti-VEGF therapy reaches its maximum potency. If there are persistent aneurysms, we perform PDT; otherwise, we continue to treat with aflibercept and extend with PDT PRN. It is important to note that when interpreting the ICGA, there are the early phase acute lesions, mid-phase hypercyanescence of the full vascular abnormality, and late-phase lesions, which is the area upon which the PDT treatment should be planned (Figure 4). Figure 4 shows the early mid and late phases of the ICGA. Treatment with PDT should be based upon the hypercyanesence of the late phase angiography. Aneurysmal type 1 neovascularization is a major public health issue globally and is widely considered to be a common variant of AMD, especially in East and South Asia, which is where the highest number of AMD patients are currently residing and projected to reside in the future.1 Although the classification of aneurysmal type 1 neovascularization (PCV) in the context of AMD or other macular diseases is evolving, it is important for today’s ophthalmologists to consider this entity in patients with the aforementioned clinical characteristics and be cognizant that aneurysmal type 1 neovascularization may occur in individuals across various ethnicities. 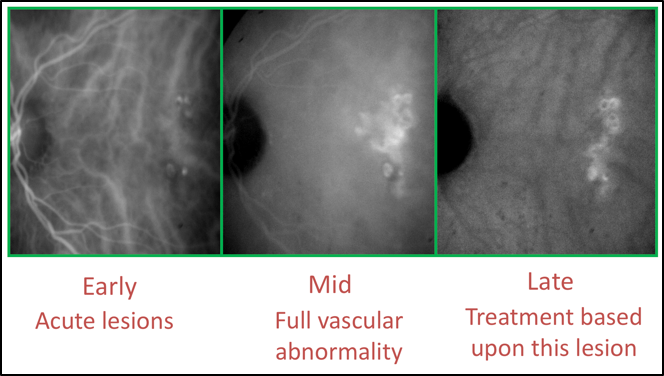 Multimodal imaging, especially ICGA, is still essential in making an accurate diagnosis, which is paramount now as recent clinical trial data have shown that combination therapy with PDT and anti-VEGF can provide patients with better visual and anatomic outcomes than anti-VEGF monotherapy while reducing the burden of treatment. Supported by the Macula Foundation Inc.
1. Wong WL, Su X, Li X, et al. Global prevalence of age-related macular degeneration and disease burden projection for 2020 and 2040: a systematic review and meta-analysis. Lancet Glob Health. 2014;2(2):e106-116. 2. Byeon SH, Lee SC, Oh HS, Kim SS, Koh HJ, Kwon OW. Incidence and clinical patterns of polypoidal choroidal vasculopathy in Korean patients. Jpn J Ophthalmol. 2008;52(1):57-62. 3. Koh AH; Chen LJ, Chen SJ, et al. Polypoidal choroidal vasculopathy: evidence-based guidelines for clinical diagnosis and treatment. Retina. 2013;33(4):686-716. 4. Liu Y, Wen F, Huang S, et al. 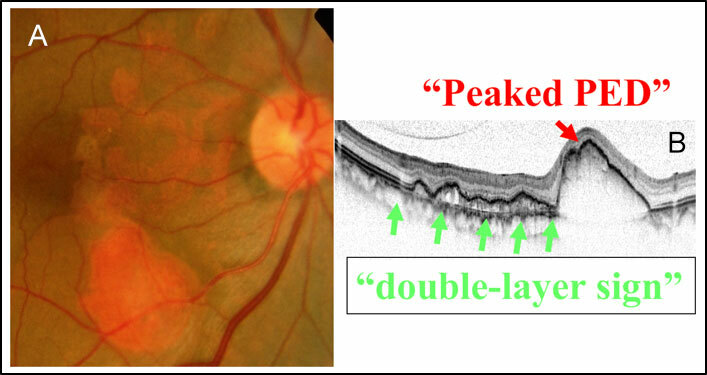 Subtype lesions of neovascular age-related macular degeneration in Chinese patients. Graefes Arch Clin Exp Ophthalmol. 2007;245(10):1441-1445. 5. Maruko I, Iida T, Saito M, Nagayama D, Saito K. Clinical characteristics of exudative age-related macular degeneration in Japanese patients. Am J Ophthalmol. 2007;144(1):15-22. 6. Wang ZY, Zhao K, Zheng J, et al. Systematic review and meta-analysis of the association between complement factor H I62V polymorphism and risk of polypoidal choroidal vasculopathy in Asian populations. PLoS One. 2014;9(2):e88324. 7. Yannuzzi LA, Sorenson J, Spaide RF, Lipson B. Idiopathic polypoidal choroidal vasculopathy (IPCV). Retina. 1990;10(1):1-8. 9. Terasaki H, Miyake Y, Suzuki T, Nakamura M, Nagasaka T. Polypoidal choroidal vasculopathy treated with macular translocation: clinical pathological correlation. Br J Ophthalmol. 2002;86(3):321-7. 10. Rosa RH Jr., Davis JL, Eifrig CW. Clinicopathologic reports, case reports, and small case series: clinicopathologic correlation of idiopathic polypoidal choroidal vasculopathy. Arch Ophthalmol. 2002;120(4):502-508. 11. Lafaut BA, Leys AM, Snyers B, Rasquin F, De Laey JJ. Polypoidal choroidal vasculopathy in Caucasians. Graefes Arch Clin Exp Ophthalmol. 2000;238(9):752-759. 12. Koh A, Lai TYY, Takahashi K, et al. Efficacy and Safety of Ranibizumab With or Without Verteporfin Photodynamic Therapy for Polypoidal Choroidal Vasculopathy: A Randomized Clinical Trial. JAMA Ophthalmol. 2017;135(11):1206-1213.